Developed to help with muscle systems used for a particular sport, sports massage uses a variety of approaches to help athletes in training — before, during, or after sports events. 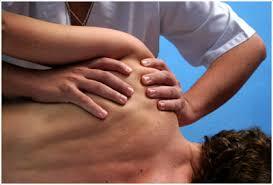 Sports massage emphasizes the prevention and healing of muscle injury. Good for chronic pain or restricted range of motion, this session may include deep tissue, compression, and cross fiber massage, trigger point therapy and PNF stretching. You might use it to promote flexibility and help prevent injuries. Or, it may help muscle strains, aiding healing after a sports injury. Sports massage has been proven to be effective for releasing and reducing tension in the muscles, improving circulation, encouraging the removal of waste products (such as lactic acid) and stimulating or suppressing nerve activity. Massage also helps to mentally prepare the athlete for the activity ahead. Sports Massage can be effective for all stages of the performer’s participation including the preparation, training, competition and recovery stages. This type of massage also helps to relax the body after exercise which can prevent injury. Sports massage is highly beneficial for those athletes who are prone to overuse injuries, since the muscles are allowed to relax and recover fully before the next exercise session; examples of these injuries include golfer’s and tennis elbow and thrower’s shoulder.